I published a previous analysis here on the composition of the best decks in the meta, and I’m continuing that analysis in this posting. 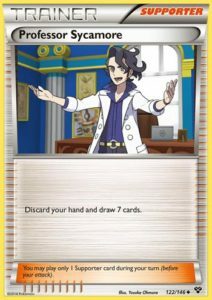 That analysis looked at the first month of the meta post Ultra Prism. This analysis includes all of that data and also brings in data from all of the major events after March 17th as well. All data herein comes from the limitless website. I go to the completed tournaments, pull up all of the decklists from those tournaments, and copy and paste the data over into an Excel spreadsheet where I use a variety of formulas and macros to manipulate it into usable data. I’m more than happy to provide you with this raw data if you’d like to work it yourself. Just let me know in the comments and I’ll send you a copy. Limitless doesn’t have every decklist from every tournament. They have the majority of top finishers but not all, but I think what we have here is probably very representative of the current meta. There were a LOT more tournaments in the first month post UP than the second. I had 171 decklists last time, this time I have a total of 222, only about 50 more. There were eleven events in the first analysis; there have been only five additional events since then. This analysis does not contain any sort of weighting for the amount of players at a particular tournament. For example, 1st place at Collinsville with more than a thousand players is given an equal representation as the 1st place finisher at Bogota which had only thirty players. The smaller tournaments could potentially skew the data, but I’m just not sure exactly how to adjust for this. I only have partial lists of data in this article. Full lists are available on PDC. Feel free to check out the full lists if you are interested in seeing them. Alright now that that’s out of the way, let’s get down to the number crunching! The last column is the average number of cards per decklist, for some reason I can’t put the title in the header. And again, I apologize for not being able to get the publish to web function to work properly. If you want to see beyond the top ten, I have all of that at PokedeckCentral. The big thing to note is that Cynthia drops out of the top ten when we’re just looking at decks that finished 8th place or higher and Float Stone takes her place. She didn’t fall far, though, only from 9th to 11th. 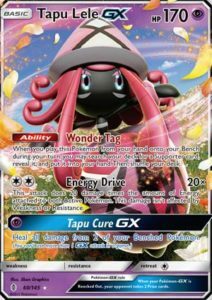 The big things to note here: Garbodor BKP will get you into the top 64 but won’t get you into the top 8. Also, running Octillery is good way to help get yourself into the top 8. So I’ve ranted multiple times about how 90% of the Supporter cards that are played consist of six unique cards… three of which are rotating out of the Standard format at the end of August. This will mark a significant strategical shift in the new meta. Top 8 decks run Lele just a little bit less than the overall decks. 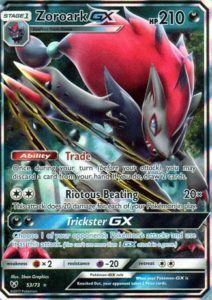 There’s a little bit off a drop off with Zoroark GX from overall to top 8. Buzzwole, Lycanroc, Octillery, Sudowoodo, and Regirock are all more prevalent in the top 8 than in the overall universe. Garbodor BKP has a huge drop off between overall and top 8. Almost 90% of the Supporters played in all decks consist of six unique cards … three of which are rotating out at the end of August. Almost 90% of the Supporters played in all decks consist of six unique cards… and there are thirteen Standard legal expansion sets at the time of this writing. 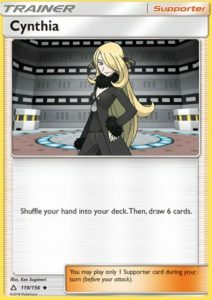 Top 8 decks run more Sycamore and less Cynthia. 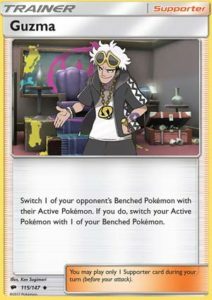 Top 8 decks run more Guzma and N. The only card run in every top 8 decklist was N.
A little bit more than 90% of all Item cards played consist of eleven unique cards. Three different Tool cards make up over 99% of the top 8 Tool card population. I did a one off analysis from this and came up with a total of 192 out of the total 222 decklists ran SPE. That’s a whopping 86% of meta decks ran some sort of SPE. Fighting types were more prevalent in the top 8 than overall. Grass, Fire, Lightning, and Water as well but to a lesser extent. Metal, Dark, and Psychic were all less likely to make the top 8.